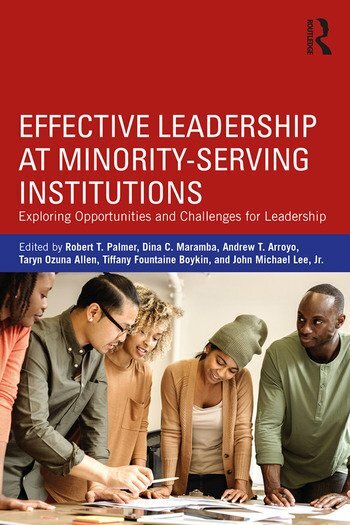 Robert T. Palmer, Dina C. Maramba, Andrew T. Arroyo, Taryn Ozuna Allen, Tiffany Fountaine Boykin, John Michael Lee Jr.
Strong, effective, and innovative leadership is critical for institutions of higher education, especially for Minority-Serving Institutions (MSIs). Indeed, research and examples have shown leadership instability among some types of MSIs, while discussions and research on effective leadership for other MSIs is noticeably absent from the extant literature. In this volume, noted experts, researchers, and leaders discuss opportunities and challenges for leadership across the full range of MSIs, while creating a dialogue on leadership models and best practices. Chapters explore issues at Historically Black Colleges and Universities (HBCUs), Hispanic Serving Institutions(HSIs), Tribal Colleges and Universities (TCUs), and Asian American and Native American Pacific Islander Serving Institutions (AANAPISIs). This book helps higher education and student affairs scholars and administrators unpack contemporary leadership issues and strategies, and synthesizes best practices to help MSI leaders increase the effectiveness and sustainability of their institutions. Robert T. Palmer is currently Interim Chair and Associate Professor in the Department of Educational Leadership and Policy Studies at Howard University, USA. Dina C. Maramba is Associate Professor of Higher Education at the Claremont Graduate University, USA. Andrew T. Arroyo is Associate Professor of Interdisciplinary Studies, Co-Director for Learning Communities, and Program Director for the Career Pathways Initiative at Norfolk State University, USA. Taryn Ozuna Allen is Assistant Professor of Educational Leadership and Policy Studies at the University of Texas at Arlington, USA. Tiffany Fountaine Boykin is Assistant Dean of Student Services at Anne Arundel Community College, USA. John M. Lee, Jr is Vice Chancellor for University Advancement at Elizabeth City State University, USA.